It's my second attempt in Gnocchi making and I feel great. I'm actually having so much fun. I remember Mary Moh @ Keep Learning Keep Smiling made this once and serving it with palm sugar syrup. That sounds wonderful & interesting indeed! But I still prefer to have mine in creamy soup or sauce, more to savoury kinda serving but I definitely will try out the sweet version some day as well. Probably very soon. (1) combine olive oil, salt and hot mashed sweet potatoes, mix well. (2) slowly add in flour and mix untill well combined. (3) divide dough into 4 portion and roll them out into a cigar shape. (4) slice into 1cm nuggets and roll them on a ribbed board to get the ribbed effect. (5) then cook gnocchi in a pot of boiling water untill they float. (6) remove them from boiling water once it's done. (1) preheat frying pan with butter. (2) saute onion, celery, green bell pepper, mixed herbs and black peppercorn for about 5 mins. (3) add in tuna & chopped sausage and cook for another few more minutes. (4) stir in flour and mix well. (5) add in salt & pepper, chicken broth and milk/cream, cook for about 10 mins or untill the thickness as desired. (6) finally, stir in the cooked gnocchi and mix well. (7) off the heat, serve hot with Parmesan cheese and top with chopped mint leaves. This sweet potatoes gnocchi is less chewy unlike the yam abacus gnocchi I made earlier because of the tapioca starch I've used in that recipe. This is a very unique dish and it goes really well with the chowder. Some gnocchi recipes contained of eggs and cheese. I'm going to omit both because I don't want them to spoilt the origin sweetness in it. Frankly, I didn't expect my boy, the picky eater will like this because he's never a big fan of any handmade noodles. Surprisingly, he did! He actually had a second top up and he told me that the sweet potatoes gnocchi tasted absolutely marvellous. Very origin, very sweet and very tasty! Haha... what a compliment from my boy. Hope you guys will like it too! Kristy, I never have this b4, so curious to know how is it taste like :). I never have this b4 too, but it look nice and good. Hey Kristy, they look so cute, like snails. And another success! Love the combination with tuna. Great photos! I need to learn to make better gnocchi with you! I've never heard of sweet gnocchi! I always thought it was only served with a savoury sauce! haha...that sounds so cool! This looks and sounds really yummy =) I made gnocchi for the first time yesterday (with normal potatoes)- it was so fun! I'll havcve to try it with sweet potatoes one day- I love the colour and it sounds delicious too! Oh my gosh...Kristy, you are killing me with this one!! I have always wanted to make them. I tried once recently but failed right at the beginning. I will have to try again.....soon :D The sweet version is very delicious but I love your savoury version very much, too. Thanks very much for the mention. Hope you have a great day! What a great recipe for gnocchi! It sounds delicious and perfect for this time of year. 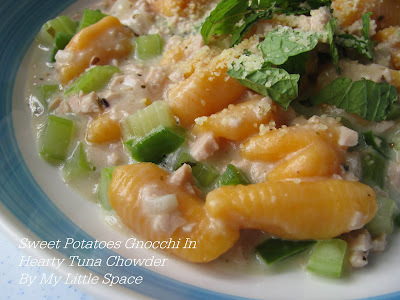 The chowder looks so delicious and just excellent with sweet potato gnocchi! Yum! I haven't cooked chowder, but looks awesome comfort food, yum! Mmmmmm I love gnocchi, I only make them with regular potatoes, but I must try your recipe! your dish is amazing ,kristy,i love your little gnocchi,they have a unique color! and you have a garganelli comb,wow,i wish one:))! this is really comforting looking and I am super curious to try this out. Combines very different flavors. Very creative cooking! Bravo for the gnocci master! Your gnocci looks absolutely perfect. I want to practice making pasta over the winter. That dish looks absolutely delicious! Beautiful photos! Looks so yummy! 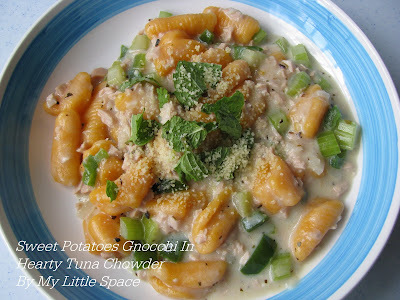 I tried making gnocchi once too and loved it!Have to try with sweet potato next time. Your sweet potato gnochhi look so good Kristy! One of my all-time favorites! Love that creamy sauce. I love gnocchi though have never made it myself. Yours look like the turned out perfectly! This looks so comforting and delicious. Homemade gnocchi and chowder - seems like the perfect comfort food. The dish looks absolutely delicious!!! Hey, sorry guys! I was so tired and taking a day off. Jess & Sonia : Thanks! Gnocchi is more or less like yam abacus. Less chewy and it's much sweeter. Cheah : Yes, that's what it suppose to look like! Belinda : Thank you for your kind words. Your dear friend Patty can cook very well too. Actually, I'm about to hop over to make the PFB voting after this. Von : I want to try the potatoes gnocchi as well. Thank you! MaryMoh : you're welcome! Yes, it's actually pretty tricky and you need a lot of patient. Pam : Hi there, nice to hear from you and glad that you like it too. I think pumpkin gnocchi should be perfect for this coming season. Rebecca : Thank you. I believe you can do much better than this. Spoon : Thanks alot! Chowder is actually more or less like creamy mushroom soup. Kumi & Priscilla : Hope you will like it, my friend. Jeannie : Yeap, just the way I want it. Alison : You mean you can get that garganelli comb over in Romania? Hey Kristy, I have been making gnocchi the past week too. Your sweet potato version looks delicious! Jwalker : Thank you very much for your kind words and hope you will like it too. HH : Thank you, dear. I'm sure you can try this with pumpkin too since it's autumn and there will be lots of pumpkins available in the market soon. Dimah : Thank you very mich! Pigpigcorner : Thank you and hope you will like it. Reeni : Hope you will like this recipe and thank you! HngryDog : Thank you! The process wasn't bad at all. Hope you will try to make your own some day. Jet : Hi there, welcome to my humble little space. Glad that you like this recipe too and hope to hear from you more often. Megan : Haha...I think you're pretty tired! See, you even call yourself as Megsb! hehe... Take a good rest , honey! Peanutts : I'm fine, thank you! I was trying to take a good rest. Thank you everyone for spending your time with me. I have to rush over to make some votings after this. So, hope you're all having a fabulous day. 3HTummies : Thanks! Looking forward to your upcoming gnocchi post. See ya then. Hope you're having a great day. Kristy, you are one of best cooks I have known! Sweet potato gnocchi...wow..that's something! I think w/o cheese in the gnocchi will be better. I've eaten gnocchi at Shook, Starhill and I felt so cloyed. I think it's due to the cheese in it. I can only imagine how delicious this must have been! Yum! Fabulous this time of year!! The pics look wonderful Kristy. Mouthwatering! That is one gorgeous dish. I love your pasta board. Awesome!! I have got some sweet potatoes @home and I was looking for a good recipe. This looks really yummy; I will try to make this. Thanks for posting it. Oh I love making sweet potato gnocchi! I served it last year at Thanksgiving with a sage-brown butter. Yours looks beautiful and perfect! We just had our first gnocchi meal tonight! Loved it! Ours was store bought gnocchi though. =) Future goal: make our own! I LOVE gnocchi and always order them if they are on the menu in a restaurant. 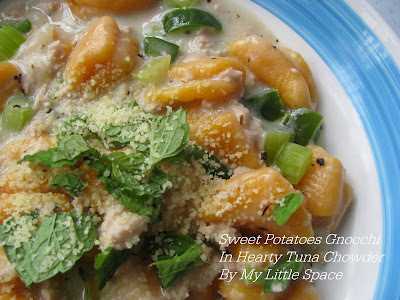 It's been way too long since I made some... Sweet potato gnocchi sound perfect! Angie : Oh so sweet of you to say that! I don't think I'm the best but I'm sure we're all great cook! Yeap, we are Super Housewives! Wendy : From my opinion, I still think it's much better if we use tapioca starch in the mixing. The dough stands well and the texture is more firm. Claudia : Me too! I think pumpkin should works terrific as well. Glad that you like it too. Gourmet Foodie : You're welcome! Hope you will like it. All the best. Fimere : Merci, glad that you like it too. Chef : Wish you all the best and have fun! Andrea : Yeap, it is! I think the origin sweetness of it just marvellous to go along with any sauce or soup. Thank you all for stopping by and spending your time here with me. And glad to know that you all like this recipe too. Hope you'll enjoy the making and have fun. I'm always looking for something new to try especially Italian/pasta. This looks great. I'm going to have to give it a go for my girlfriend and I.
I'm glad I came across your blog, everything looks good.